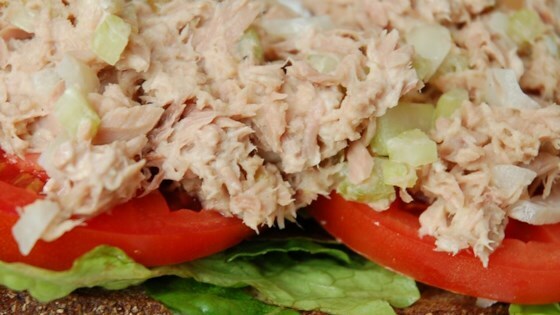 "This takes boring canned tuna and adds a little zing to it. Dill pickle relish works great, too." Mash tuna in a small bowl with a fork. Add mayonnaise, pickle relish, mustard, celery, onion, and black pepper; stir to combine. Chill and serve. Classic flavors of the Mediterranean combine in this tantalizing tuna salad. I've used this recipe using Tuna or Chicken - both get good reviews. I do doctor it using fresh lemon juice, more mayonnaise, chopped garlic plus fresh snipped parsley to give it more zing. I liked this recipe and will make it again, it tasted great on toast. However, I used 2 tsp of the Dijon Mustard and 1 1/2 tsp's of the relish. I'm not a big celery fan so I left that ingredient out. Otherwise this is a great tuna salad recipe, I especially enjoy the onions in it. The mustard and relish helped me forget that I didn't use as much mayo as I normally do. I left out the onions and celery and it was still delicious!